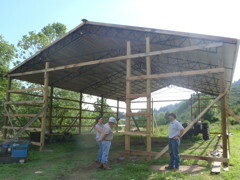 Construction of pole barn for calves. Elymus is expanding to respond to the high demand for replacement heifers that have been trained to stand in headlocks. He is building a 40-foot by 100-foot pole barn with locking head chutes to raise Springer Holstein calves. The barn houses newborn calves, which are placed in locking headstalls to eat their rations so that they don’t fight over food. The stalls also train them for the future when they undergo medical examinations, milking and breeding through artificial insemination. Poured-in-place feeders facilitate quick feeding with less waste and feces contamination. Stationary water troughs provide a constant ample supply of fresh water. Less labor is required to check water, train cows and remove wasted feed on the ground to control vermin. Swing stalls that allow tractor access also cut time spent cleaning stalls in half. Elymus’ goal is to produce 80 calves a year, tripling his bottom line in four years. In addition to high quality heifers, Elymus also has more manure for his fields. The new barn opens an opportunity for Elymus’ youngest grandson, Dalton Payne, 19, to work full-time. 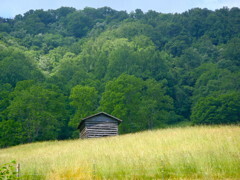 “It is my goal to keep this farm in the family as a working farm as long as there is a Payne who wants to stay active,” Elymus said. Elymus plans to sell the heifers to dairy cow brokers and advertise in Hoard’s Dairy Magazine and on Craigslist.org.